silvieon4: I don't have a "chaquit'!!!! Momma you know very well what I am talking about. "chaquit"*... baby chick. I learned it from listening to you, that's where. Anyhow. I was catching up on my emails and low and behold what do I see? 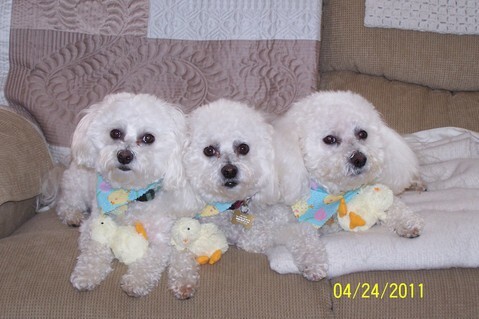 Benny, Pepe and Peanut all with their own Easter chaquit. Notice.... each has one. I must say the Z boys really look great. Hiiiii Bennny!!! Wait how about Fishel!!! Momma go here and get him for me...http://www.judaism.com/display.asp?nt=ajao&etn=IADDD He is no chaquit, but he will do.... I need to feel loved. I know Passover it's over. I am not holding that against you... I just want Fishel. ROTFLMAO! I LOVE the idea of squeaky plagues! 'Vie - you crack me up! Wow who would have thought they make plague toys! Fishel is adorable - it rhymes! Personally I like Smaltz the Chicken. Aww 'vie...we are so sorry that you have been deprived. Hope your momma listens and gets you a special friend!